Freddie Mercury, the legendary, golden-voiced lead singer of Queen, passed away 25 years ago this month due to complications from AIDS. Before his death, though, he and his bandmates—Brian May, John Deacon, and Roger Taylor—became one of the biggest rock bands in the world. After starting as a prog rock band with fantastical influences, Queen became the kind of iconic group that is still played in sports arenas, karaoke bars, and even theater halls to this day. While the entire band consisted of talented musicians, the Mercury’s dynamic personality and showmanship made him one of the great frontmen of all time. 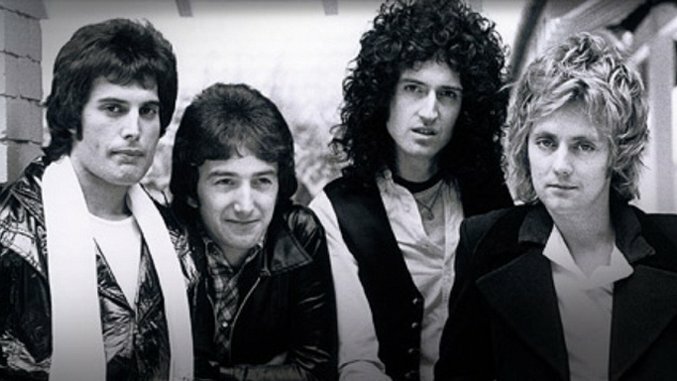 In honor of the late, great singer, here are the 15 best Queen songs. Right out of the blocks, we get some indicative of the insane bombast that Queen could pull off. However, despite the theatricality of the band, and Mercury in particular, even they barely seem to stay on top of “Somebody to Love.” It’s more in line with a song from a Hollywood musical than a rock song. It’s like Freddie Mercury watched Grease and decided he could do them one better. It’s a jam packed number, and a nice love song to boot. If nothing else, “Radio Ga Ga” evidently inspired Lady Gaga’s stage name. While people think of Queen as a ‘70s rock band, which they were (and a successful one at that), this song has an incredibly ‘80s vibe. It’s almost indistinguishable from Starship’s “We Built This City,” which many consider one of the worst of all-time. So how is “Radio Ga Ga” so good? First, because “We Built This City” is a better song that it gets credit for. Second, because this is Queen. Mercury’s voice, and also the instrumental acumen of the other three members of the band, were able to make ‘80s cheesiness work for them. Speaking of ‘80s cheese, “I Want to Break Free” could not embody ‘80s pop music more if it tried. However, it is also the apotheosis of ‘80s pop. It’s got the perfect ‘80s keyboard and ‘80s guitar sound. “I Want to Break Free” is lyrically simple—the notion of “breaking free” is discussed at length—but it’s an infectious toe-tapper. Mercury does a fine job, but his vocals don’t necessarily carry the entire song. Also, the music video for the song featured the band dressed in drag in a parody of British ITV soap opera Coronation Street, which apparently made it banned on MTV. We’ve come a long way, baby. Flash Gordon is a campy sci-fi action film from 1980. It was written by Lorenzo Semple Jr, the genius behind several episodes of the great ‘60s Batman show. Queen did the score for the film, including its opening theme song. This song included dialogue from the movie. Does that mean you have to have seen the movie Flash Gordon to enjoy the song? Do you need to have seen Batman to enjoy Prince’s “Batdance?” The answer is of course not. This is one of Queen’s two perennial sports anthems, although “We Are the Champions” can only be used in pretty specific situations. While it leans itself to sports so well, “We Are the Champions” is just a song of triumph that should get you amped regardless of the circumstances. Funnily, it’s partially a ballad, but then the chorus swells and you feel like you can run through a wall. That’s the power of music. That’s the power of Mercury’s voice. “Crazy Little Thing Called Love” feels like Queen channeling a country band with Mercury doing his best Elvis impersonation. In fact, Mercury and Elvis have a fair amount in common, as showman with natural charisma that at times threatened to overshadow their singing chops. If you’ve ever wanted Queen with a honky-tonk vibe to it, this is probably your favorite song by them. This is a very silly song and its title does not lie. Since it’s Queen, though, the propulsive song features great harmonies. Perhaps the fact that Mercury is known to be gay adds a bit of wry amusement to the tune now (even though May wrote the song). Still, in terms of songs dedicated to female posteriors, only Sir Mix-a-Lot can challenge this Queen’s crown. “Killer Queen,” from Queen’s 1974 album Sheer Heart Attack, feels sort of like a transitional song for the quartet. It has that classic Queen sound we are so familiar with, but its dense, cryptic lyrics are reminiscent of its prog rock roots. This is a song with the words “gunpowder, gelatine, dynamite with a laser beam” in the chorus. Mercury’s sonorous, high-pitched voice sells it all, though. If you only know one Queen song (and the odds are very low you only know one Queen song), it’s probably “We Will Rock You.” Just two minutes long, it’s mostly all “boom, boom, clap” with a few May guitar licks thrown in. However, that simple beat is so insanely catchy that the song has become legend. There probably isn’t a day that goes by where “We Will Rock You” isn’t played at least one sporting event. Ubiquity and quality do not always go hand in hand, but fortunately “We Will Rock You” is a rollicking rocker. Your run-of-the-mill band could not make this strange and ambitious song work, but Queen does. “Bicycle Race” includes several different sections: There’s the part where Mercury croons, “I want to ride my bicycle. I want to ride my bike.” There’s also the fast-paced, back-and-forth nature of the verses. At first, it doesn’t seem nearly as melodic as your average Queen song, but then, the bridge rolls around and the entire band harmonizes about bicycle races. Are there bicycle bells included in this song? You bet. If you needed proof how talented Queen was, “Bicycle Race” is it. Deacon wrote this beautiful song for his new wife, but it’s Mercury’s voice that makes it so resonant. It’s a perfect match of material and performer. It’s a wonderfully bright pop rock song. The Wurlitzer electric piano part is so catchy, and every time they sing, “Ooh you make me live,” it sends a chill down your spine. It’s a really lovely, loving song, both lyrically and musically. Much like how Wayne’s World probably made a lot of people aware of “Bohemian Rhapsody,” “Don’t Stop Me Now” probably gained some new fans from its use in Shaun of the Dead. Sure, it’s used to comedic effect in a scene involving people fighting zombies, but it was a nice choice, because it’s a great song. It’s high energy and the singsong element of, “Don’t stop me now” is so catchy it’s almost impossible not to bob your head to it. It feels like the song races along, and Mercury races along, but it never gets going too fast. Wayne’s World is a great movie with many fine qualities. The fact it helped to re-popularize “Bohemian Rhapsody” is perhaps its greatest gift to society. How this song became a hit is so baffling. Not because it isn’t a great song. It is. It’s also an opera in miniature that’s, like, four or five songs jammed into one. It has the line “Scaramouche, Scaramouche, will you do the fandango?” in it. It shouldn’t work, but it does. Every part works, from the somber piano ballad parts to the rocking guitar solo. It’s a few good songs spliced together into one great song. “Another One Bites the Dust” was Queen’s biggest hit in the United States. Deacon wrote this song, as well, which may be why it has such an iconic bass line. At times, “Another One Bites the Dust” feels restrained, but then Mercury bursts through with his vocals to give the song a real intensity. Apparently the song is about the St. Valentine’s Day Massacre, but it’s still great even without knowing that gory backstory. This is a song that has both Freddie Mercury and David Bowie on it. How could it fail to be anything other than great? Plus, “Under the Pressure” is so catchy that Vanilla Ice was able to ride its bassline to success. However, to focus on the great instrumentation of the song is to overlook what makes “Under Pressure” truly special. If you ever needed to know why Mercury was so beloved, just listen to the isolated vocal takes. This is maybe the best vocal performance of one of the best rock vocalists of all-time.